This former French hill station is the capital of Lam Dong Province in southern Vietnam’s Central Highlands. Situated on a plateau 4,900 feet above sea level, Dalat offers a cooler climate than what you might be used to elsewhere in Vietnam. In fact, long pants and sweaters are usually needed if you’re visiting from November to March. The charming city is small and walkable and well-know for its wide variety of the many flowers, fruits and vegetables that are grown here in the surrounding farmlands. Popular with local honeymooners for the scenic setting, as well as tourists looking for a cooler climate, Dalat offers many things to see and do, great food, and the chance to try a few more adventurous activities like canyoning, mountain biking, white-water rafting and treks into the surrounding hills. Whether you’re thinking about going, just curious, or you’ve already booked a trip, here are some of the best things to do in Dalat. Anyone visiting Dalat will at some point hear about the “Crazy House," a unique attraction in the city and definitely a must-see for curious travelers. Designed by Dang Viet Nga, a Soviet-trained Vietnamese architect, Hằng Nga Guesthouse (more commonly known as Crazy House) looks like something out of a surreal fairy tale in the best way possible. The building’s overall design resembles a giant tree with rambling offshoots, winding bridges, and sculpted elements in a variety of shapes inspired by nature. The design of Crazy House often draws comparisons to Antoni Gaudí and Salvador Dalí and was built between 1990 and 2010. It takes about an hour to wander through the complex and explore the many unique design elements at every turn. Depending on how much time you have, it’s also possible to spend the night here. If it’s panoramic views you’re looking for, make time for a ride on Dalat’s cable car. A relatively new attraction, this is the best way to get a sense of the beauty of the region’s patchwork of farmland, greenhouses, crystalline lakes and distant mountains. The cable car connects Robin Hill with Truc Lam Pagoda and Tuyen Lake. The 1.5-mile ride (one way) is a picturesque one, and you get a cable car to yourself. At the top you’ll find the grounds of Truc Lam Pagoda, which house an active monastery, so expect to see monks going about their daily business. Public areas include a ceremonial hall, bell tower and beautiful flower garden to walk through. Make your way to tranquil Tuyen Lam Lake for even more photo-worthy views before taking the cable car back down. 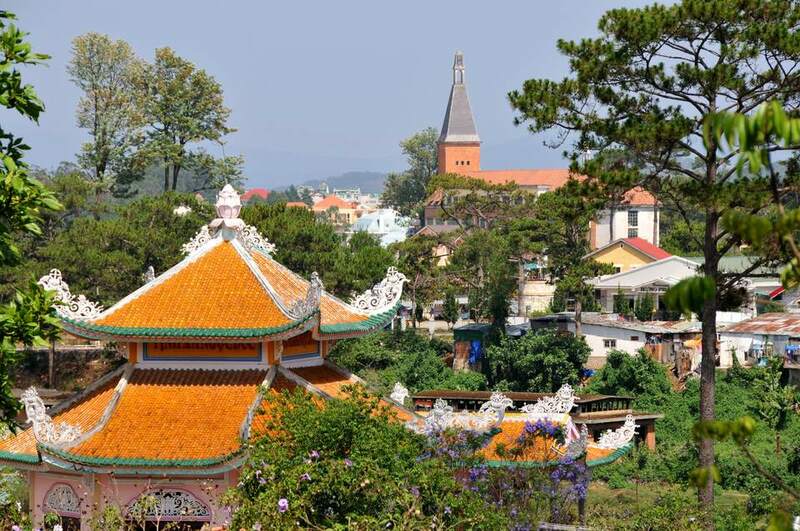 Dalat is often referred to as the City of Flowers for a very good reason. The climate is such that various types of flowers can be grown year-round and Dalat Flower Garden is a great place to see the vibrant blooms, may of which can’t grow anywhere else in the country. Established in 1966, the gardens are located on the north side of Xuan Huong Lake in the heart of the city. Over 300 types of flowers are grown here, and it’s easy to lose track of time on a meandering stroll through the colorful displays. Local markets offer a good chance to get a better sense of local life, and Dalat Market in the center of town is no exception, especially when you consider all of the abundant locally-grown produce offered. Head here to browse stalls of the aforementioned produce, consisting of everything from strawberries and artichokes, to cauliflower and spinach. There is also an array of flowers, as well as local teas, coffees, honey and more. If you’re hungry, make your way to the food court on the top floor for cheap local eats. Once the sun starts to go down, the area near Dalat Market starts to look a bit different. Numerous colorful stalls are set up to sell local snacks, second-hand clothing, and souvenirs, and the atmosphere is a lively one. If you didn’t pack for the cooler weather in Dalat, get yourself a cheap second-hand jacket of which there are plenty. Or simply browse the stalls, shop for souvenirs, and most importantly, fill up on street food—grilled meats, roasted chestnuts, grilled cobs of corn, noodle dishes, hot soy milk, baked sweet potatoes, crab soup and more are available. One of the most popular dishes is tráng nướng (known as Dalat pizza), which is basically large sheets of rice paper grilled over hot coals and topped with egg and scallions, dried baby prawns, and sweet and spicy sauce. The market is open from 5 p.m. to 10 p.m. Both locals and visitors alike seem to have an affinity for Xuan Huong Lake. The manmade, crescent-shaped lake is located in the center of Dalat and is a justifiably popular spot for picnicking, cycling, walking and jogging. There are benches here if you need a rest and there’s the option to rent a swan-shaped pedal boat if you want to be out on the water. You can usually find various street food stalls here, and the surrounding area offers a good choice when it comes to coffee shops (Dalat is know for its coffee) and restaurants. Built in 1943, Dalat Railway Station has been recognized as a national cultural site. Construction on the railway station began in 1932 and was completed in 1938. For the most part, this is just a place to come and snap a few pictures of the stationary steam train on the premises (always popular for selfies), but you can also take a short three-mile ride that follows the historic line to a tiny village named Trai Mat that offers scenic countryside views. Conveniently located just a few kilometers south of town, Datanla Waterfalls may be touristy, but that doesn’t mean they’re not worth a visit. Most visitors come here to ride the mini roller coaster ride from the top of the falls, which is not so much a traditional coaster but rather a control-your-own-speed alpine coaster that zips you down the hill for an exhilarating ride.